UPDATE: The developer has since confirmed that the game was removed due to an incorrect ESRB rating. It is being re-rated and will be available again soon. 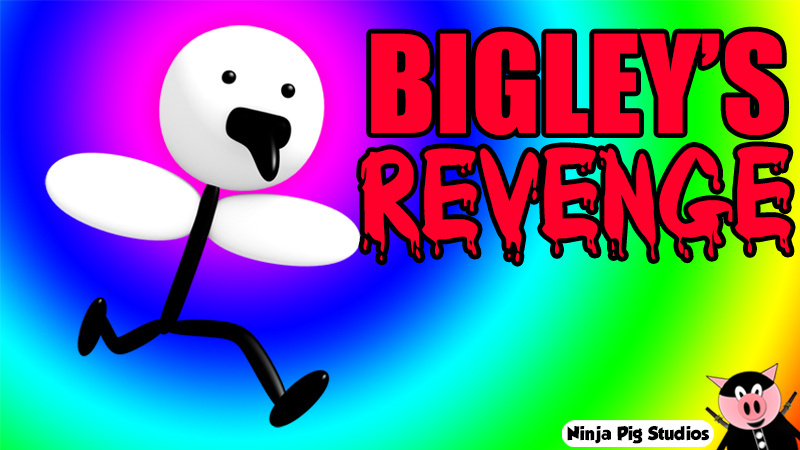 ORIGINAL STORY: As some of you may have been aware, Ninja Pig recently released a new game on the eShop called Bigley's Revenge. The latest game from this infamous studio appears to be a shooter, with numerous references to 'dank memes' from across the internet. It appears that something is amiss, however, as the game has now been taken off of the eShop and its Miiverse page has been shut down. Ninja Pig's previous release, Meme Run, was pulled off of the storefront due to copyright infringement, though it remains to be seen if this is the case once again. There's no official word on when, or if, Bigley's Revenge will be available; we'll keep you posted if the reason for its removal is given. What do you think? Was this also on the grounds of copyright infringement? Are you disappointed to see this has been taken off? Drop us a comment in the section below. I don't think it was copyright infringement but then again I didn't think the troll face was copyrighted. If it was because of the quality of the game Nintendo should also remove The Letter then but I doubt it was because of that either. So sad. I knew this was going to happen, I should have bought it when I had the chance. This guy hasnt learned a thing has he ? I mean, kudos to everyone being resilient, but sometimes you just need to face facts and realze that you might lack talent or creativity. Or youre just betting on the wrong horse. Maybe these "Meme" games arent as great as they sound...IF they sound great at all that is. Stuff like this belongs on a flash game site at best. Put it there, evolve as a developer, learn a thing or two and come back with some serious attempts. Stunts like this will only ruin your image and thus, any further project. I was wondering how long it would take for this game to be removed. The name of their company tells you a lot about them, no wit and taste. 'Stealth Hog studio' would've been more sophisticated. I bet his mom was really ticked when she opened the letter from Nintendo. Wow. I guess art is never truly appreciated. All right in all seriousness, who had eight days? Was there anything in it that was copyrighted? Hahahaha, best news I've read all week! What exactly is "dank" in this case? Why did this one get removed, anyone knows? @Drumpler I highly doubt the model for the shooter guy was made by Ninja Pig. It was probably pulled from some random war game like Call of Duty or something. I'd say the model is far too detailed and realistic to be Jordan's original work. First gameplay I found, for those who are curious. Thank goodness. Why does this thing even get approved for the eShop? And someone is actually angry with Ninja Pig about copyright infringement? I'd be embarrassed to fight for something as stupid as a meme... Ridiculous. @EVIL-C You're horrible. I wouldn't wish ill will on anyone. The game is a vast improvement over Meme Run even if it is not perfect and doesn't have mainstream appeal. @Nintendian Sorry, I accidentally tagged you initially. @Vee_Flames it could be someone with the copyright trolling because of Meme Run. @RCMADIAX I couldn't get Explody Bomb or Hold Your Fire any lower than E10 and those games are no more violent than Mario. @RCMADIAX wait, self rated? Is it even possible to get a game released on the eShop without a legitimate esrb rating? @dadajo If I remember correctly it was Hasbro/Wizards of the Coast as the troll face was directly inspired/taken from the DnD depictions of trolls in the Monster Manuals. @RCMADIAX interesting! So I guess if the developer lied, and someone relevant notices it, then it could lead to trouble. Not gonna lie: I couldn't help but chuckle when reading that headline. GOOD JOB, NINJA PIG! This is, what, the THIRD game you had to get rid of, counting that Jumpy Cat game that was never released? If Ninja Pig wants to make REAL games, he or they should knock off the "MLG, 420" meme bullsh*t. Otherwise, every game they make for the Nintendo Wii U eShop are going to be taken down because of this, and I will never take them seriously. Ever. ATTENTION HERE!Ninja Pig Studios said that was removed due to the ESRB re rating it to T for TEEN.They said it can be resumbited anytime. Everyone's knocking on Ninja Pig, but I wish I were as smart as the guy. Making a killing off of how little work he does. There's no shortage of meme-infested trash on PC, but apparently there's a huge group of people that only own a Wii U. ATTENTION!Check their twitter page to understand this debacle/problem. ATTENTION.Yeah its not removed due to copyright according to their twitter page and will back. @RCMADIAX hah! Looks like now we have that first time it happens. Ninja Pig will be back, so let's enjoy the eshop without his presence. I want say that personally,I think this was a stunt to get attention.Since they stated it will be back,a bunch of people will buy it in response to the removal.I think this game is overpriced and lazily constructed,but for whatever reason,the game slightly appeals to me even I think memes can be degenerating humanity. The game is coming back unfortunately according to the developer's twitter page. @Elvie Well, it will probably work. People will buy it in case it gets pulled again. @Not_Soos Unity asset store? I doubt he made it, too. @Einherjar Agreed. Also, as if the eshop had enough horrible quality games already...meme games belong on the internet as flash games period. They're so stupid. Man I remember when small companies made actual games and not stupid meme sherlock off the internet that doesn't even remotely belong on any console. It's like here lets make this game and put a whole bunch of fart sounds and ugly drawn characters made from MS paint and ship it off. Its not like you are forced to buy those games and its not like it could hurt Nintendo's image any further at the moment. And if it has problems its gonna get pulled anyway so why bother getting mad about it. @Elvie Just watch The Patriot's ending speech from Metal Gear Solid 2. I think that would harmonize very well with your viewpoint on cyber society in general. I'm horrible for being happy to see a piece of worthless shovelware removed from the eShop? Are you on his payroll or something? It's just a publicity stunt to get his crap all over the headlines again, and it's working. @dadajo The person who drew the meme is automatically his/her copyright. The same goes for a story, an article, a video, a product....Copyright costs nothing, a patent does. @Moon That's like saying "The garbage man is coming, let's bring all the trash inside the house before he collects them!" Omg, they should've banned it becaus of poor quality, not because of the rating. Seeing the video that @LinkSword posted, I think this game deserves a score of -10/10. It looks like a game made with zero effort and no passion, a toddler could probably make a better game by randomly hitting the keyboard. But the worst part is - and I actually thought about not posting at all - that it's getting so much attention despite being the worst crap I've ever seen. Eh, something I wouldn't bother getting even if it does become a rare download. It's the first time he ever "got it"? (the eshop minigame) For real? I'm surprised this one got passed by Nintendo in the first place considering that Bigley started out as a parody of Ridley. Wow... It's a fairly good budget game idea, but wow execution is bad, also I bet you guys are right, he probably stole the model for the gun and hands! Imagine how much it cost a Wii U that includes Meme Run and Bigleys Revenge. @dadajo Everything that someone creates is copyrighted unless that person explicitely states otherwise. That also applies to memes. So, if they haven't asked for permission for every single meme in the game, I'd say copyright infringement is a likely reason for the removal. Lol, yup. As I posted on the weekly download page, "I can't wait to read the 1/10 review." The guy is a complete hack, not worthy of attention, let alone releasing complete crap on the eshop. I don't know how familiar you are with his work, but this is not the first time he has run into trouble releasing on the eshop. Meme Run and Jumpy Cat (I think it was, it never released) were both subject to copyright infringement. Now he does this, and I simply agree with others that he seems to just do it on purpose to get attention. Kind of like that guy who made Flappy Bird and was deemed an App Store hero for reasons that I fail to understand. His stuff is complete garbage, and will make your eyes and ears bleed. He doesn't belong on the eshop and Nintendo needs to question their standards on the NX if crap like this continues to be made. He actually is a member of NintendoLife found at @ninjapigstudios if your interested, but hasn't posted in a long, long time though. Obviously his complete lack of quality caught up with him. Also rather famously, for those of us who remember, he went after NL's 1/10 review of Meme Run, and said it wasn't a fair review of his game. He was literally ripped apart in the comment sections, and had deleted all posts about the instance. @MoonKnight7 To be fair, Flappy Bird wasn't complete garbage, and Doug removed the game after seeing people get addicted to it. Ninja Pig's games aren't even addicting, AND cost you money. NPS should just stop uploading their games on the ESHOP. They are worthless(for a lack of a better term) and belong on flash sites on PC! Garbage, good thing its in the trash, stupid, unworthy company pumping craptastic games, like why did Ninty remove the 'Steal of quality'? should now become 'Steal of garbage' to for warn you don't buy. What a surprise! I have no clue what a dank meme is though, and google isn't exactly calling my name for me to muster up the effort to check it out. What is this game again? I don't think I even heard of it, so....Could someone remind me as to why I should care? @mikegamer You shouldn't. Nothing to see here, move along. I got it before it was removed. Normies have done it again! @BaffleBlend Parody is protected on copyright grounds, at least in the USA. Cool you make money but now everyone knows you're the idiot putting out low selling junk trying to troll the eShop for some reason, so hopefully he doesn't try to make a real game in the future because it'll be looked at as a joke and easily dismissed even if it's good. If Nintendo is allowed to dump their garbage on the NA eShop, so should everyone else. @Dankykong That won't matter at all. He simply has to release under a separate name/studio*. If he is working on a good game, this is actually very smart. Wii U devkits (especially for Unity), artists, and musicians are not particularly cheap, and based on Miiverse, he certainly has a decently-sized pool of money after this and Meme Run. *I believe to do this, you would have to get re-certified as a Wii U dev by NoA, which takes some time. Curses! I wanted to buy it just for the heck of it before they took it down. I know I regretted buying Meme Run but I still wanted to do this. @TeeJay Good, I don't plan on it. I prefer games that actually have some degree of effort and are actually worth more than a dollar. @RCMADIAX Doesn't every download title need to be approved by Nintendo before it is given a rating? @RCMADIAX Well, it is hard to rate it, because it has realistic depictions of guns but cartoon violence. So I can see where they might have missed it. @Dankykong Honestly, I think the real "idiots" are people who buy games that they don't/won't like. Some devs know they'll do it and release it anyway. I'm not saying Bigley's Revenge shouldn't exist and I don't dislike the concept. But if people hate it, why do they buy it? "For the lulz?" All I have to say is... LOL! @Zoda_Fett It's all about hits, facts have little to do with news these days. Maybe it was removed because it was just a bad game. These games really give Nintendo a bad name! It's nice if people can add games without to much trouble (to the e-shop), but there must be at least a little bit of quality in it. This is soooo low, its shameful this was allowed on the e-shop! Looks even worse then Meme-Run! @NintendoLife Considering the impact this site has on the gaming community and the size of the audience that follows you, one would think you might show a little responsibility by updating this article with accurate information. It's almost as if you are purposely trying to harm this developer for some reason. @NexisGames I've just updated the story. When the story was posted, the exact reason for the takedown wasn't known. That's not "posting inaccurate information." @Damo The reason was known shortly after this post, it's been a day, and yet, there's no update on Nintendo Life. Instead, this un-updated article is "still" popping up in Google News filling peoples heads with inaccurate information. The point? Out of sheer curiosity mostly. I found it to be a pretty legitimate question. Haha, I wish that were the case. Too bad it isn't the reason. @NexisGames We don't tend to man the site at the weekend. @Damo When it's something of this magnitude, if you can post it on the weekend, you can update it on the weekend — not to mention, it looks as if several posts were made afterwards. This is a wordpress site, its simple enough to update a post (we both know that). In my opinion this charade seems somewhat intentional, but as I stated that is only my opinion. Indies have enough to deal with, I really wish you guys understood that; if you did, nuggets wouldn't exist. Such articles can have consequences on a young studio's career even if not true. What if a interested publisher saw this article yesterday and dropped the game because of it? Please take peoples careers and lively-hoods a little more seriously, that's all I'm saying. Anyways I appreciate you updating it. @Damo Despite our punch-out style relationship, as I told you on twitter, we actually respect the hell out of this site. You guys are all great writers whom do great work and one day we hope to achieve what you have at NL. Personally, I just don't like seeing mean spirited articles like this, but I also understand that this is your site. @MitchVogel after reading your Stone Shire review, you made an initial impression as a nice guy, but to me, your tone seems to have gotten a little darker . This article didn't strike me as "righteous", in-fact, it was damning and borderline slanderous. I hope the old Mitch comes back, because if I decide to send out review codes again, it'd come to you. Anyways, I'm heading back to my side of town, take care! @NexisGames This article was actually written by Mitch, who is in the US - if you look at the time stamp (which is UK time) it says 2AM, as in 2 in the morning. That's Friday evening Mitch's time. The other content which is posted at the weekend is usually scheduled earlier in the week (the Super Scope piece was written and submitted on Friday, for example, but was scheduled for publication on Saturday), unless something massive happens that requires one of us to hop online to cover it. This isn't a Wordpress site - not sure what gave you that impression? It's a totally bespoke site with a unique CMS created in part by Ant, one of our directors. And updating the post wasn't the issue - as soon as it came to the attention of someone who could edit the original post (which was this morning UK time, when I spotted it) it was updated. The original post was made when the reason for the takedown wasn't known. Mitch doesn't state the exact reason for the takedown, but mentions that this has happened with one of your past games - that's a fact. Not sure I see any massive issue with the original post, if I'm honest. which makes this a fail... I'm just waiting for confirmation from the judges and... oh! Not only is it a fail, but it's been placed in the epic category!